keratoconus! How well do you see the world around you? 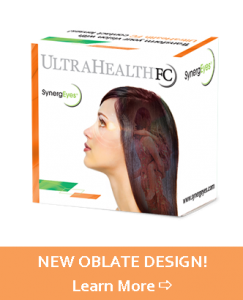 With UltraHealth take your life back and see in a new way filled with clarity and comfort. No more lenses popping out. No more irritating dirt. No more cloudy vision after a few hours of wear. And, the same size as a soft contact lens. UltraHealth FC is now available for post-refractive surgery patients. The oblate base curves offered in this edition to the UltraHealth family of lenses are well suited for post-Rk, post-LASIK and other cornea trauma conditions. Crystal Clear Vision—UltraHealth delivers GP vision from a hybrid contact lens. The “rigid” (GP) material optimizes vision; while the soft skirt centers the lens over the cornea, providing enhanced clarity and longer-lasting comfort for irregular cornea and keratoconus patients. UV Blocker—The “rigid” (GP) portion of the lens includes a UVA and UVB blocker to help protect your eyes from the sun. Long-Term Corneal Health—UltraHealth is made with materials that allow very high oxygen transmission. 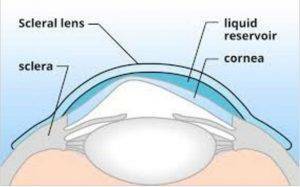 The lens design promotes tear circulation throughout the day, allowing for all-day wear. Now, you too can ‘Transform your Vision’ with UltraHealth hybrid contact lenses. If you’re looking for a new approach to keratoconus that offers the comfort of a soft lens; custom parameters, including cylinder correction to -10.00D; and the kind of straightforward fitting not found in hybrids, Alden Optical’s new NovaKone™ soft lens for keratoconus is it. While NovaKone lenses can be a viable solution for all stages of keratoconus, they’re especially effective for patients with more advanced conditions, those who have failed to tolerate GPs, or who have been unsuccessful with hybrid and scleral lenses. NovaKone is designed specifically for the keratoconic eye, with advanced design features and flexible parameters that give you incredibly precise fitting control. NovaKone soft lenses for keratoconus are indicated for visual correction for patients with all stages of keratoconus and pellucid marginal degeneration. NovaKone can be particularly successful to address cases where GP, hybrid, and scleral lenses have failed or are otherwise contraindicated. NovaKone offers extraordinary comfort and can be an excellent adjunct to other forms of correction. A true scleral lens design for managing patients with irregular corneal conditions and ocular surface disease. The Corneal Zone, comprised of the central corneal curve and the ASPHERIC peripheral corneal curve. The Limbal Zone, comprised of an ASPHERIC scleral curve. The Scleral Zone, comprised of an ASPHERIC scleral curve and the ASPHERIC edge curve. The Jupiter 15 mm and Jupiter 18 mm series lenses come in 3 configurations to address different corneal geometries by varying the posterior design. The Jupiter Standard Design, central corneal curve has a slightly steeper radius than the peripheral corneal curve. Most cases of corneal irregularity (keratoconus, post surgical, etc) are fit with the Standard design. The Jupiter Advanced Keratoconic Design has the central curve relatively STEEPER than the peripheral corneal curve. The Jupiter Reverse Geometry Design has the central curve relatively FLATTER than the peripheral corneal curve. All Jupiter 15 mm and 18 mm series lenses use aspheric optics designed to reduce spherical aberrations. The Jupiter 18 mm series lens can accommodate significant amounts of corneal asymmetry and/or irregularity. It is designed to usually be the most efficient lens for difficult contact lens fittings. The Jupiter 15 mm mini-scleral series lens is generally used when the full sized sclerals are found to be difficult for the patient to apply.